Red Harvest Research Papers explore a novel by Dashiell Hammett about a world in which it is difficult to know what or who to believe. The surrealistic world that Dashiell Hammett creates in his novel, Red Harvest, is a world in which it is difficult to know what or who to believe. It is a world in which the wisest of characters might heed the advice, “Don’t believe anything that you hear, and only half of what you see”. Throughout Hammett’s book runs the fear that nothing can be taken at face value, and nothing is what it appears to be. This fear culminates in a suspicion not only of individual people but also of the social order itself. The streets of Personville can be likened to a stage on which gangsters masquerade as business men, capitalists contract with criminals, and no one can tell the difference between them. Blend this shady behavior with the other elements in Red Harvest, that of four linked story-lines, surreal dream sequences, double crossings and double-double crossings, and the result is an absurd and surrealistic world where nothing is as it seems. The arrival of the story’s protagonist, The Continental Op, can be seen as the addition of yet another shady player onto the stage, someone ready to ad-lib his own script. From the moment he comes into town his true identity is in question. “I dug out my card case and ran through the collection of credentials I had picked up here and there by one means or another. The red card was the one I wanted. It identified me as Henry F. Neill, A.B. seaman, member in good standing of the Industrial Workers of the World. There wasn’t a word of truth in it”. The key line in the passage is “There wasn’t a word of truth in it”. In this, Hammett is letting the reader know from the start that although things are not going to be what they seem, you can at least trust that the information that the Op confides to you will be the truth. Narrating history for the reader, the Op implicitly promises to tell all. This is a crucial element of Hammett’s writing and of detective fiction in general. This is a point made very well in Robert Edenbaum’s article, “The Poetics of the Private Eye: The Novels of Dashiell Hammett”, when he writes, “The narrator of detective fiction cannot break faith with the reader because his narration is the last, best and only ground. This is why narration and the voice that renders it become so important; they represent an affirmation of signification, an assertion of mastery and control over a world otherwise unanchored” (Edenbaum). Personville is certainly such a world, and without the Op to guide us through it, it is a world that many readers would find themselves running away from as fast as they can. Photosynthesis Research Papers explore the process that is necessary for plants to survive. The Cleaners - The Cleaners is an excellent example of modern British detective fiction, less concerned with the brilliance of the socialite freelance detective and relying more on the modern techniques and situations faced by the modern metropolitan police force. The Purloined Letter - Research papers on Edgar Allen Poe point out that the most significant of the Dupin detective fiction stories is The Purloined Letter, written in 1844. 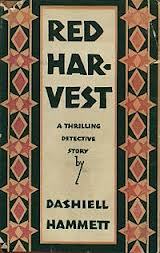 Paper Masters writes custom research papers on Red Harvest and explore a novel by Dashiell Hammett about a world in which it is difficult to know what or who to believe.